Australian Addiction Author Library- Purchase your book today! 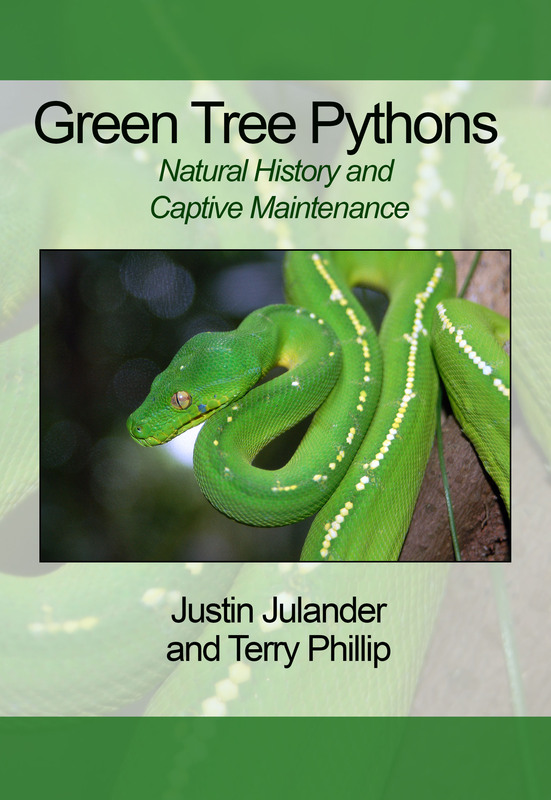 "In the last 20 years there have been changes and advances in the understanding of many aspects of green tree pythons, both in nature and in captivity. That is where this book comes in. The authors, Justin Julander and Terry Phillip, are both experienced snake keepers with extensive and successful experience maintaining and breeding pythons. Both have a particular and unwavering interest in green tree pythons. This book they have created is a beautifully illustrated synthesis of the advances made in keeping and breeding of green tree pythons." "With the publication of The Complete Carpet Python, authors and well-known American python breeders Nick Mutton and Dr. Justin Julander present a well-researched and fascinating summary of just about everything that is presently known about carpet pythons – from the biogeography and life-history of all species and subspecies within the complex, to detailed information on all aspects of captive biology for the group. 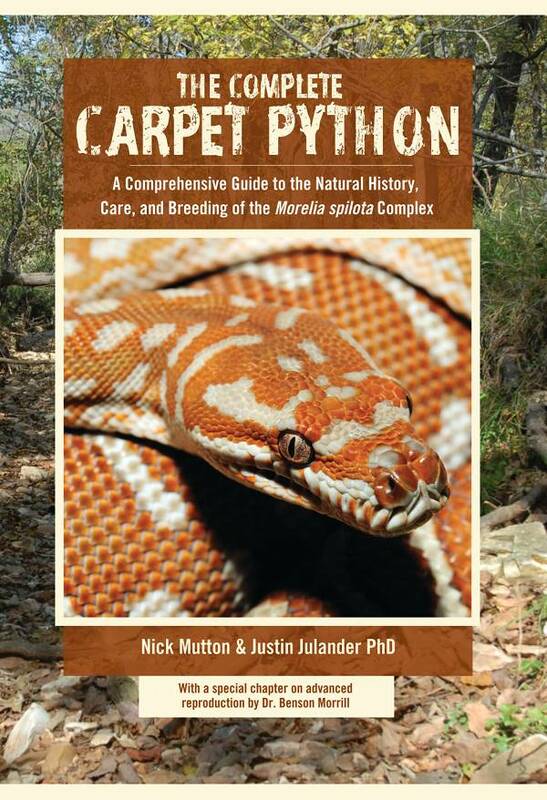 Although the book will provide a considerable amount of useful information for both the amateur and professional scientific herpetologist, it is likely to be of the greatest interest and value to the aspiring python breeder – who for too long has had access to precious little information about the natural history of the carpet python - and only fragmented resources pertaining to keeping and breeding techniques. Of special interest to experienced breeders is the photographic representation of known carpet python ‘morphs’ within the hobby. For the reader, the well-written text falls neatly into logical sections, and is complimented throughout with many beautiful and informative photographs." The genus Antaresia, a group commonly referred to as the Children's pythons can be found across the continent of Australia and a small portion of neighboring New Guinea. The group, comprised of the Children's python (Antaresia childreni), spotted python (A. maculosa), pygmy python (A. perthensis) and the Stimson's python (A. stimsoni), contains the smallest pythons in the world. Despite their small size, these snakes are ideally suited to life in the often-harsh climates of their native Australia. These two factors- sze and durability- have made this group popular among python keepers for many years. 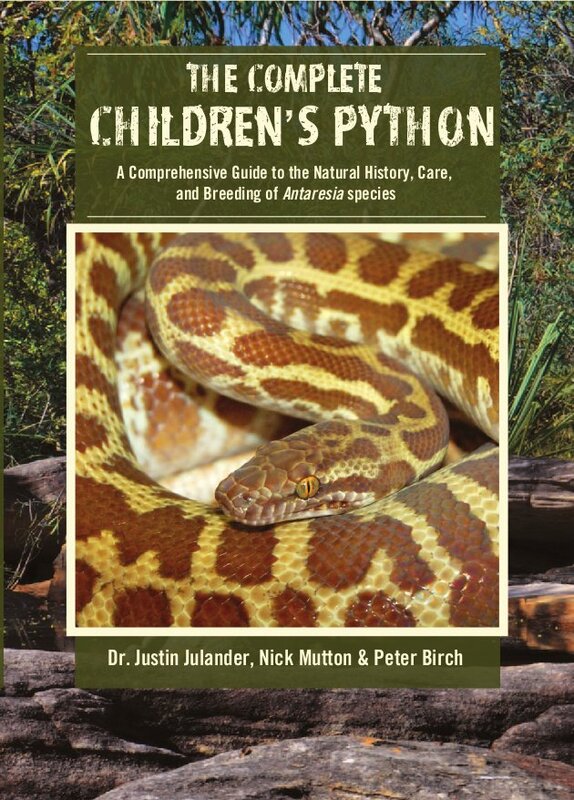 THE COMPLETE CHILDREN'S PYTHON is dedicated to all aspects of this amazing group of snakes with particular emphasis on natural history, biology, and reproduction. The authors have beautifully illustrated the immense diversity and natural beauty contained within wild populations of these pythons. This group has previously been underrepresented in herpetocultural literature despite being one of the world's most successful and widespread python genera.